Do you remember the most recent instance of Carrie Fisher outing John Travolta? And how every time someone on Pajiba mentions Carrie Fisher, they also mention how good her Wishful Drinking live show is? Only I remember that? *crickets* Oh well. In any case, it reminded me to pick the book up at the library and finally read it. It is a fairly short book, and very quickly paced. The entire time I was reading it, I was thinking about how this would make an excellent performance piece. For the majority of the chapters, it feels as though Fisher has transcribed the show verbatim for the book. The only chapter that felt slightly more fleshed out is the seventh, “Sadness Squared,” which provides details around her drug addiction and how it affected her life. It is one of the few chapters where the paragraphs do not begin with “So, I said/so, you see/so, I’m told…”, slightly less conversational in tone. 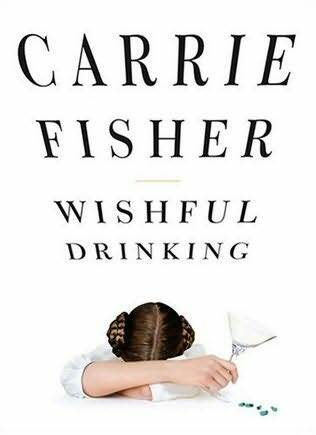 Wishful Drinking is certainly a fun book to read; how could it not be, with the interesting life Fisher has had? She was married to Paul Simon; married and had a child with a man who later told her he was gay; had a friend (a Republican party organizer, no less) die in her bed; is the daughter and step-daughter of interesting Hollywood personalities; was counselled on her drug problems by Cary Grant, etc. It is a generally jokey summary of a few of the major events of her life, but seems a bit superficial, as if she were just hinting about some of the stories that she could tell given the right opportunity. I wonder if this is because, as she mentions at the beginning of the book, the electric shock therapy has really wiped out swaths of her memory, or if she is demonstrating restraint out of respect for the privacy of her friends and family. Overall, this is a fun and light read, and would be perfect for times when you are likely to be distracted or don’t want to have to tax your brain. So you’re saying it makes a good travel book? A nice stuck-in-an-airport-due-to-a-snowstorm book? I will keep that in mind if/when I next fly. Exactly – the chapters are short and self-contained, so you can read one quickly before your boarding call/switch to another gate, and your enjoyment won’t be diminished by the interruptions. I read the first couple of pages on Amazon. I am embarrassed for Carrie Fisher in that she is not a talented writer. Decided not to download.